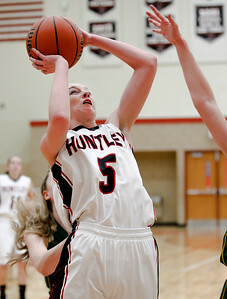 Sarah Nader- snader@shawmedia.com Huntley's Morgan Clausen shoots during the first quarter of Tuesday's game against Crystal Lake South in Huntley January 13, 2014. Huntley won, 46-29. 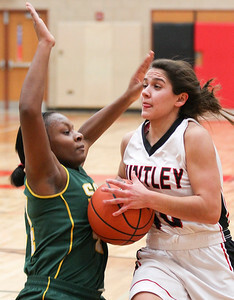 Sarah Nader- snader@shawmedia.com Crystal Lake South's Kianna Clark (left) guards Huntley's Kayla Barreto while she dribbles towards the basket during the third quarter of Tuesday's game in Huntley January 13, 2014. Huntley won, 46-29. 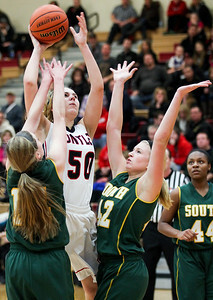 Sarah Nader- snader@shawmedia.com Huntley's Ali Andrews (center) shoots over Crystal Lake South players during the second quarter of Tuesday's game in Huntley January 13, 2014. Huntley won, 46-29. 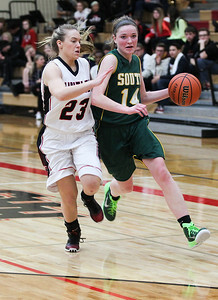 Sarah Nader- snader@shawmedia.com Huntley's Jessica Brock (left) guards Crystal Lake South's Chanel Fanter while she dribbles down court during the third quarter of Tuesday's game in Huntley January 13, 2014. Huntley won, 46-29. Sarah Nader- snader@shawmedia.com Crystal Lake South's Hailee Massie (left) and Huntley's Kaitlin Costantino try to grab a rebound during the third quarter of Tuesday's game in Huntley January 13, 2014. Huntley won, 46-29. 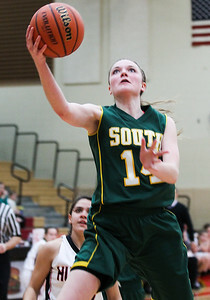 Sarah Nader- snader@shawmedia.com Crystal Lake South's Chanel Fanter shoots during the third quarter of Tuesday's game against Huntley January 13, 2014. Huntley won, 46-29. 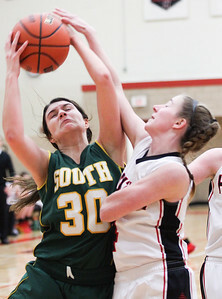 Crystal Lake South's Hailee Massie (left) and Huntley's Kaitlin Costantino try to grab a rebound during the third quarter of Tuesday's game in Huntley January 13, 2014. Huntley won, 46-29.